Experience the same half-press for focus, full-press to shoot function as your dry-land photography with the AquaTech Elite II D850 Underwater Camera Housing. Designed for use with the Nikon D850 DSLR, the housing's electronic shutter controls (one for portrait, one for landscape) provide a sensation similar to the camera's half-press shutter function, allowing the user to easily determine the half-press for focus and full-press for shutter release. 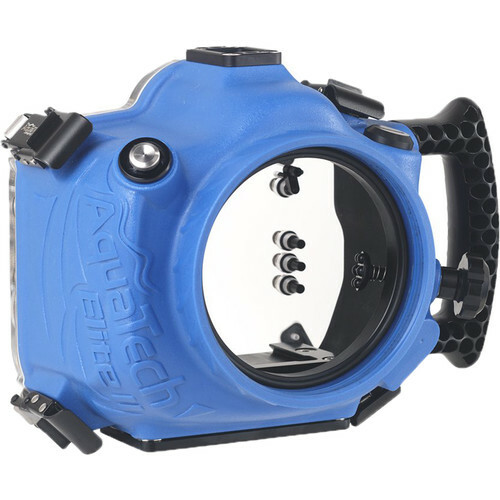 A flash bulkhead sync connector, supplied with AquaTech flash housings, enables the Elite II to work with separately available accessories such as external strobe units and pocket wizards. A threaded 1/4"-20 mounting point at the bottom of the housing enables connection to an optional tripod or tray. The enclosure ships without a required lens port and accepts a series of ports for a wide range of lenses. For complete compatibility information, see the Port Chart.